Gregor Schiffer, managing partner at the FMG, manages future projects in the fields of early identification of future markets, development and implementation of future strategy, as well as in innovation management. He focuses on the initiation and sustainable implementation of custom-made and pragmatic solutions. 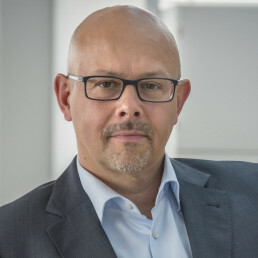 Gregor Schiffer studied Business Administration, spent several years teaching and researching the fields of technology and innovation management at the RWTH Aachen. He was a long-term partner and owner of management consulting firms for mid-size and large companies in industry, trade, and telecommunication. "Change comes faster than expected - often from the outside - no matter if we approve of it. This is what needs to be brought into the hearts, minds and muscles of decision makers." An expert in the future of energy and infrastructure as well as the worlds of living, Gregor Schiffer speaks on his area of expertise.